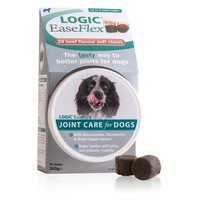 Logic EaseFlex Joint Care for Dogs has been specially designed to help support healthy cartilage and soothe and support normal joint function in dogs. Each super tasty soft chew has been made using premium vet quality ingredients and contains a high concentration of active ingredients that play an important role in the formation and repair of healthy joint cartilage. I have a large sledge dog who suffers from joint pain due to arthritis. He was initially on Rimadyl from the vet but as it can have side effects with long term use I searched for alternatives. I am amazed at how happy and mobile he is now since I have been giving him a daily dose of Flexivet Go. He has been taking it now for 6 months and is a different dog. He jumps up and down like a jack in the box now when he gets exited and that's something he hasn't done for 3 years! It has proved its worth to me now I can see my big old sledge dog happier, pain free, mobile. Excellent product.